Fun 1st grade math activities will help make learning math a lot more exciting for kids. You'll find activities here that are great for use at home or in the classroom. Supplies: Game board for each player. Buttons or coins to be used as Counters for each player. The number of counters needed depends on the size of numbers you want your students to work on. For fact families up to 20, each player will need 20 counters. Preparation: Print game board for each player. Copy and laminate the game board. Each player should be given the appropriate number of counters. Tell the players how many counters to place on their board.You can use buttons, coins or anything that is convenient for the counters. In the above example we started with four counters on the left-hand side of the circle and one counter on the right-hand side. Each player will then write as many addition and subtraction fact families as they can using the counters on the left as one number and the counters on the right as their other number. Another fun and simple 1st grade math activity to help the young ones to learn addition and subtraction facts is with fact family cards. Print off the Fact Family Cards - Set1. I will be adding more fact family sets for you to print in the next week or two so check back. You can cover up one of the numbers on the card as in the picture below. 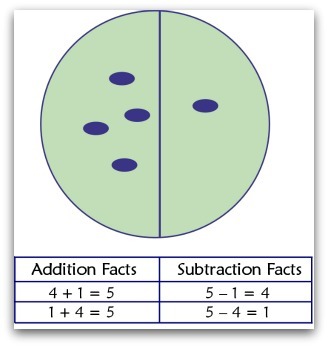 Then say each missing number as part of an addition problem or a subtraction problem. Look at the examples below. Ask "What plus 4 is 7?" Ask "7 minus 4 is what ?" If you enjoyed this one, you'll probably also like Addition Concentration.